1.8.1 Follow Us on Facebook! 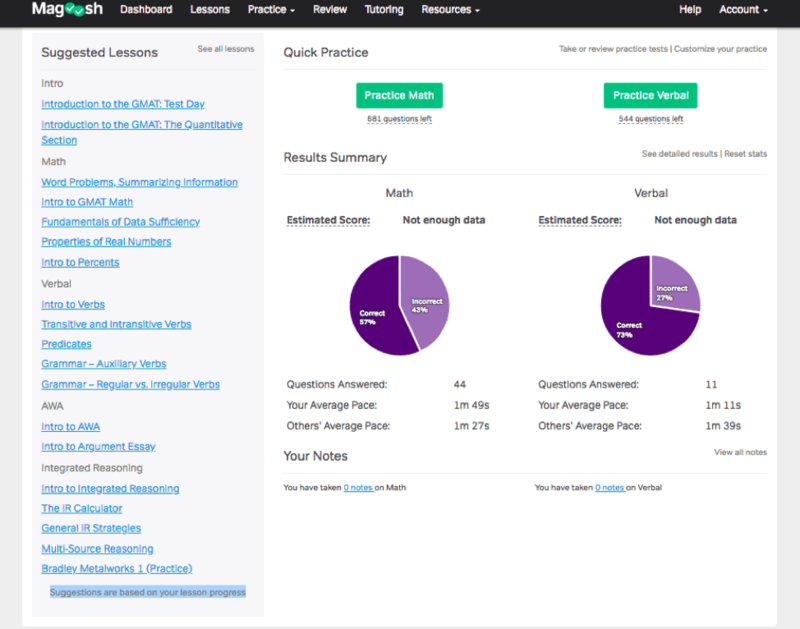 Magoosh is relatively new to the test prep market, but is quickly becoming a serious competitor to the more established test prep providers. And for good reason. Calling themselves the “practical GMAT prep for people who have no time for GMAT prep,” Magoosh offers effective and customizable test preparation courses and materials, all at an affordable price. 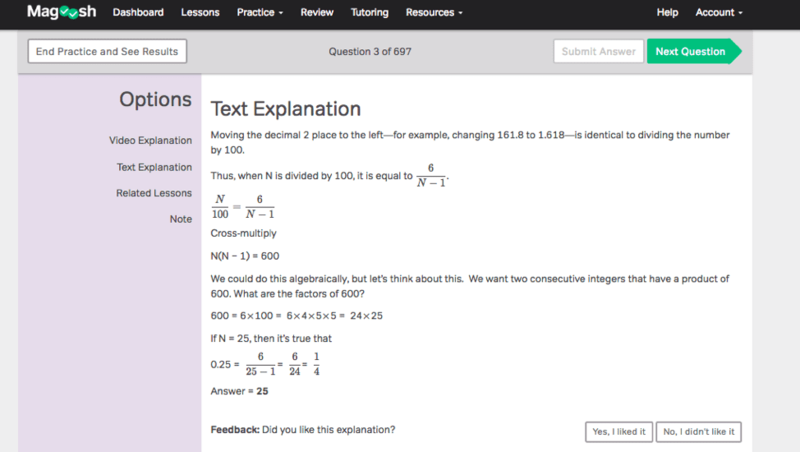 Magoosh focuses on being user friendly, offering one of my favorite interfaces of all of the test prep solutions. The site and the app are easy to navigate, and available anywhere at any time. Magoosh offers 300 lessons, 1,250 questions, and a few full-length practice exams. Their courses are completely online and available in a mobile app. There are no books or software to carry around. There are two areas that Magoosh materials absolutely excel. These include their mobile app and their explanations that go way beyond typical text explanations. 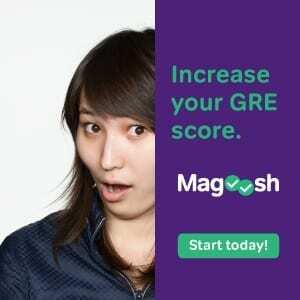 The Magoosh app has every single quiz and lesson that their site has, which is much more than most of their competitors, making the Magoosh GMAT prep courses more convenient than others. The Magoosh GMAT test prep courses also offer extensive video explanations. This is particularly valuable for those students who learn better by watching someone explain a problem than by reading the solution. Magoosh offers 1 – 3 minute video explanations that go well beyond the typical text explanation. They do everything they can to clarify particularly challenging questions. After watching the video explanations, even the most difficult problems become solvable. They eliminate confusion and explain why a particular solution works. They also usually discuss the basics of the problem, along with any rules and equations that you need to solve that one and others like it. Like many students, I find it difficult to understand an explanation without seeing it written out. Seeing the solution on the video, as it is being explained, is usually much more helpful than just reading a text explanation. Magoosh videos also offer alternative solutions. Early on in your GMAT studying, you will notice that some problems can be solved using logic rather than arithmetic or other math skills. It is important to be able to determine when this is an option, as usually the logical solution is the faster solution. Your typical test prep course will only explain the math-based solution. Magoosh offers the logic-based solution, and then goes on to explain why it is better. They also offer math-based shortcuts if available. This goes well beyond the traditional explanations offered by other test prep providers. If the solution is still not clear after watching the video explanations, each question will have a link to one or two blog posts that further explain the answer, give suggested lessons to review, and offer even more explanations. They also offer Frequently Asked Questions about the problem, addressing common mistakes and answer traps. They address the “why” something works as well as why it does not work – helping test takers better determine which choices are the wrong ones. The Magoosh GMAT Prep offers a self-study course starting at $219 for just the Quantitative and Integrative Reasoning sections, a full self-study course starting at $249, and guided study course with tutoring for $799. This is one of the least expensive options available to GMAT prep courses. All three packages come with a score guarantee, and no shortage of test prep materials, a lot of value for a great price. All of these package prices offer you one-year’s access, which is longer than most of their competitors. They also have a 30-day self-study course for $219. One of the things I love about the Magoosh site is that they offer seven different GMAT study plans with varying degrees of commitment. Of course, the plans involve a Magoosh GMAT prep course, but they give you an idea of the time commitment that you may need to get the score that you want. The plans give instructions for each week of your timeline, from 30 days to six months. Their blog also offers an extensive library of strategy, lessons, and general GMAT information. They also have three eBooks, including the Complete Guide to GMAT Idioms that could potentially benefit any studier, even if the Magoosh GMAT prep courses are not for you. The Magoosh GMAT prep course is the least expensive test prep option that we have reviewed, with a thirty-day, full test, self-study course at $219, and a full service, year-long, self-study option with six hours of tutoring at $799. There is a lot of value in the Magoosh GMAT prep courses. 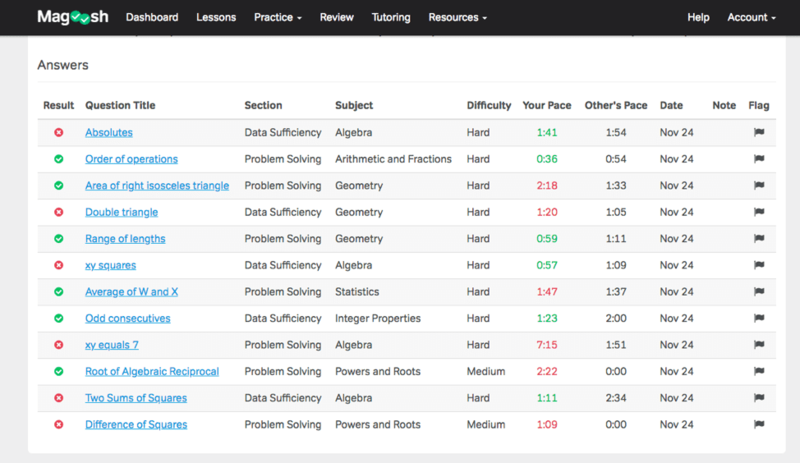 From the Dashboard, you are able to jump to suggested lessons, practice questions, and reviews. You are also able to track your progress and determine your estimated score. The Magoosh GMAT prep courses are 100% flexible and personalized to your study time and pace. You can review, rewind, or skip ahead as necessary. You can set up customizable practice quizzes based on your specific needs, level of difficulty, timing, number and type of problems, and section. You can even decide if you want explanations as you go or not. Magoosh also offers a Smart Review, or an ability to tailor your study time. The system analyzes the results of your previous questions, details your progress and gives you a score estimate. It offers suggested lessons, based on what you’ve accomplished, your strengths and weaknesses, and the level of difficulty you’ve answered correctly. There is also a Notes section on each question. Here you can add any concerns or thoughts you have about each question so that you can easily refer back to it later. Magoosh offers a full year’s worth of GMAT prep access. This is substantially longer than the four to six months of most of its competitors. They offer a discounted 30-day plan as well, but most of their plans are for one year. This gives even the most long-term studier plenty of time to study. There are two things that I think are lacking with the Magoosh prep options. The first is that they do not offer any in-person classes and the second is the lack of dedicated full-length practice tests. For some students, taking an in-person class holds them accountable and gives them the highest chance of success. Magoosh does not offer any in-person courses, so if this is something that you are looking for, take a look at our comparison chart for more options. Kaplan GMAT prep might be the best option for you. Unfortunately, the Magoosh GMAT practice tests are limited to your unanswered practice questions. There are no dedicated full-length practice tests. You can take as many practice tests as you like, but you may end up using up too many practice questions. For this reason, Magoosh recommends only taking two practice tests. This may not be enough to develop the skills and stamina for the actual GMAT. If you want the most practice exams, take a look at The Princeton Review courses, which offer ten. The Magoosh GMAT prep Guided Study Premium Course ($799) offers 6 hours of one-on-one tutoring via Skype. This is a $660 value, and is included with the price of the course. The Magoosh GMAT tutoring package is the least expensive tutoring package available. They also offer a la carte tutoring for $110 per hour. With their Premium subscriptions, Magoosh guarantees a 50-point increase in your overall score. With the Math only subscription, they guarantee a 3-point increase in your Math section score. If you’ve taken the GMAT in the past, and don’t see an improvement, Magoosh will give you a 100% refund. Take a look at their site for more information. Magoosh offers a 7-day free trial with access to 30 video lessons and 30 practice problems. This should give you an idea if the Magoosh prep course is right for you. You also have a 7-day money back guarantee, after you have purchased the full course. If it is not right for you, they will offer a refund, no questions asked. You do well studying on your own and are able to stick to a study plan. Magoosh offers several different study plans that are customizable to each test taker. If you are able to stick to them, and enjoy studying at your own time and pace, Magoosh GMAT prep courses might be a great fit for you. If you learn better by watching videos rather than reading explanations, Magoosh GMAT prep courses are a great options. 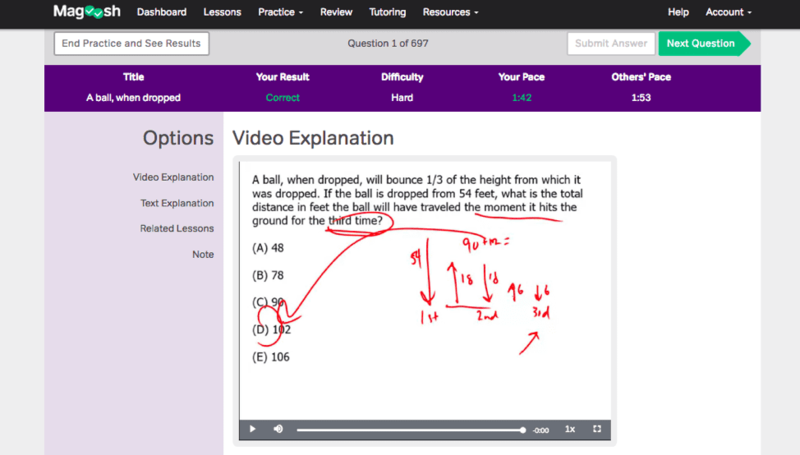 Each lesson is taught via video and every single practice question has a 1 – 3 minute video explanation. You may also like the Magoosh GMAT Prep courses if you plan to study for longer than three to six months. All of their plans, except the 30-day plan, offer access for one full year, longer than the four to six months offered by most of their competitors.